An expression of interest is alive in the eyes of this young boy, in a children's home, on the outskirts of Chennai in Tamil Nadu, India. What do you know about orphans? 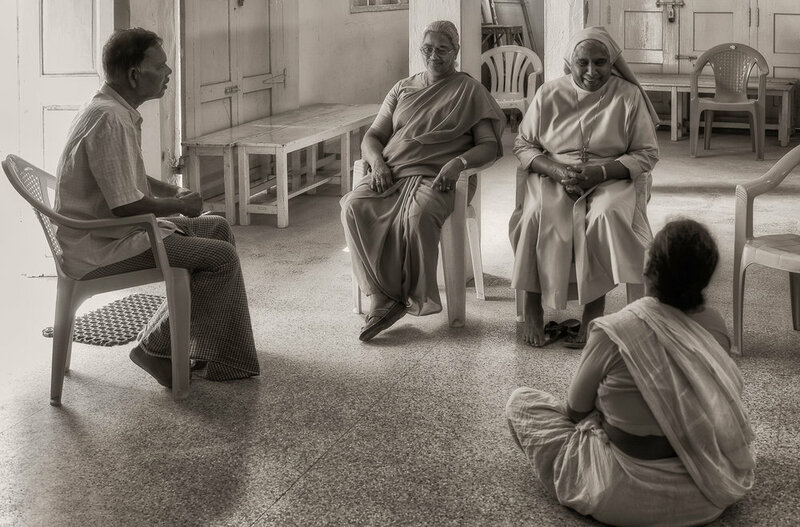 The following tutorial video details my approach to photographing young children in a convent run orphanage on St. Thomas Mount just out of Chennai in India. The video explores technique, approach, stylistic concerns and my own motivation for undertaking this self motivated project, despite being very ill at the time. It's my hope that, as well as providing great tips by which you can improve your own photography, this presentation will inspire you to undertake your own creative projects through the art of photography. A beautiful relief of Jesus Christ on St. Thomas Mount on the outskirts of Chennai, India. The camera is far more than just a tool by which the photographer pays her way. Your camera is a passport into exotic worlds and the lives of people beyond your normal, everyday experience. The camera doesn't just help you see the world around you, it enables you to express how you feel about what you see. It’s the ideal tool of the diarist, the artist and the travelling wanderer within us all. What To Think About When Buying A New Camera? When purchasing a camera don’t be overly seduced by specifications or the old features/benefits dribble you’re likely to hear from a sales person. Be clear about how much money you have available to spend and about what you want the camera and lens in question to do for you. Make sure you pass this information on to the sales person to help them narrow down the choice of cameras they’re likely to show you. Before making your decision ensure the camera you like the most feels good in hand. The relationship between photographer and camera is a very personal experience. If it’s not it’s likely you’ve purchased the wrong camera. It should feel comfortable in hand and relatively easy for you to locate and activate the various buttons and dials to set the camera for the photos you’re likely to make. If you have big hands and fingers you’ll probably struggle with an itsy bitsy camera with tiny buttons. Likewise your photography will be a much more enjoyable process when the camera you purchase feels good when placed up against your face and, in the case of more expensive cameras, your eye fits comfortably into the camera’s viewfinder. Days end, after an evening service at St. Thomas Mount National Shrine in Chennai, India. I wish you luck on your own journey of exploration through the art of photography. That which is both inward and outward bound.